calapex has no other items for sale. Genuine Riitek product. Authorized Rii USA Seller. This is a wonderful combo, 2.4GHz Mini Wireless QWERTY keyboard, TouchPad combo. just by using this wireless mini keyboard and mouse with touchpad. 92 keys, 2.4GHz wireless Keyboard with Touchpad. Touchpad DPI adjustable functions. Quick delivery.Super quick response from seller.Works Great. Thank you for the Rii mini! Keyboards remote control a better way to have. I love the keyboards for editing and typing. Saves time and eliminates frustration from using regular remote control. thought I was getting one that had backlight, but this one doesn't. Besides that, it works great and is nice to have because it is so small. An absolutely phenomenal that's easy to use and reliable. Wish I'd bought one sooner. For a produce coming from China I was impressed with the quality and workmanship. 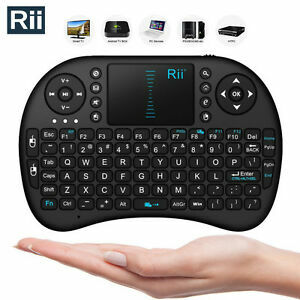 Rii the company making this mini keyboard has done a great job and I may buy some of their other models.